This past July, Highland Park, Illinois hosted a delegation from its sister city Puerto Vallarta, Mexico. Among those in the delegation were two artists, Abdallahy and Santiago Polvos. The pieces created by Abdallahy require 4D glasses to be worn when viewing in order to be fully appreciated and they are deeply rooted in ancient Mexican culture. Polvos is a well-known artist in Puerto Vallarta and his work is known for his unique use of light and images depicting Mexican subjects and themes. The artists exhibited at The Art Center (TAC) in Highland Park and at the Mexican Consulate in Chicago. 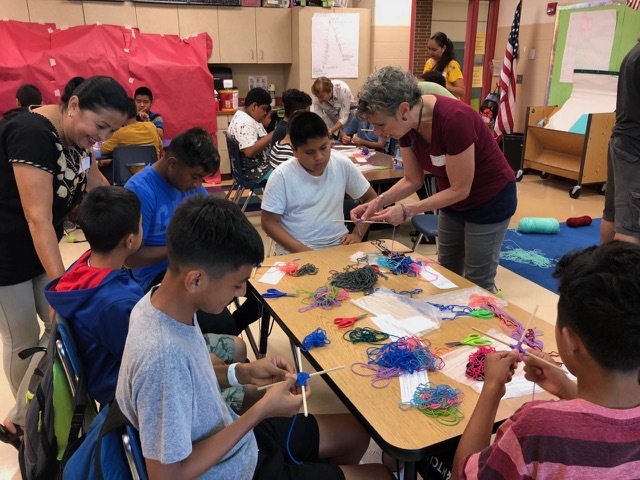 Architect and artist, Citlalli Perez, lead workshops in Highland Park/Highwood, teaching students to make the Eye of God, a cultural and spiritual Mexican symbol, with yarn and sticks. The exchange included a picnic and concert at Ravinia, a music venue in Highland Park and summer home of the Chicago Symphony Orchestra. Highland Park and Puerto Vallarta officially became sister cities in 2002. Their relationship began due to Highland Park’s large Mexican population and the sizable amount of Highland Park residents who travelled to Puerto Vallarta in the winter months. This visit is one of many art-focused exchanges between the two cities. Two years ago, a delegation visited Highland Park as a part of the Cultures United by Music program. The young music students participated in workshops and attended Chicago Symphony Orchestra concerts at Millennium Park in Chicago and the Ravinia Music Festival in Highland Park. In the past, the Highland Park Sister Cities Foundation has organized artist, architect, student, yoga, and culinary exchanges. The Highland Park Sister Cities Foundation is currently celebrating being awarded Sister Cities International’s Award for Innovation: Youth and Education at the 2018 Annual Conference August 2-4. They received this award because of the success of their Virtual Classroom project, which allowed students from both cities to study American and Mexican poetry together. No Replies to "Highland Park, IL Celebrates Another Successful Art Exchange with Sister City Puerto Vallarta, Mexico"